Here’s a look at 5 reasons you should visit Mont Saint-Michel, the third most visited site in France. 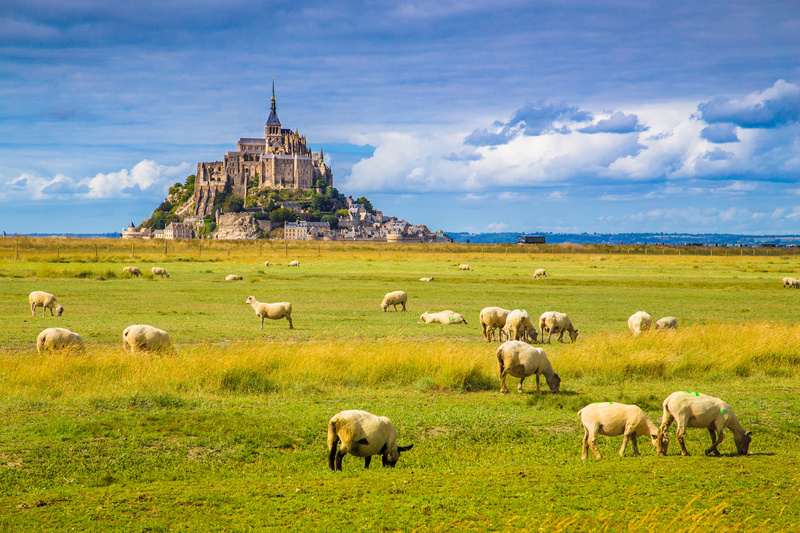 For anyone with an imagination, Mont Saint-Michel is like a childhood dream come to life. This medieval village surmounted by an abbey is perched on a granite rock in the middle of the sea. This life-sized sand castle of sorts is the third most visited site in France after the Eiffel Tower and Versailles. Here are five reasons why Mont Saint-Michel is a must-see for travelers from all over the world. Located only three-and-a-half hours from Paris, Mont Saint-Michel is a true emblem of French heritage. Perched on a rocky islet, this “Wonder of the West” offers a tidal spectacle unlike any other the world that can only be seen from above…not from the mainland. Throughout the day, the tides follow one another giving rise to an incessant and surprisingly wonderful ballet. Some days, when the tides reach a coefficient higher than 110, the Mount becomes an island again. The best time to visit is two hours before high tide so as not to miss the rising water. The emblematic character of Mont Saint-Michel is also due to its silhouette, made incomparable by the presence of the Benedictine abbey topped with the dazzling Archangel Saint-Michel. In the tenth century, the Benedictines began constructing an abbey on Mont Saint-Michel, which became one of the largest medieval pilgrimage sites. The monastery shows impressive architectural skill as it embraces the rock’s slopes and rises more than 150-meters high, its shape integrating perfectly into the mountain. A night visit during summer is especially exquisite. When you visit Mont Saint-Michel, you simply must stop at Mère Poulard, an inn famous for its omelets, which are cooked over a wood fire (a true emblem of French gastronomy) and made from a 130-year-old recipe. This undisputable icon opened its doors in 1888 and is an integral part of Mont Saint-Michel’s identity. If you’re looking for a gourmet souvenir, Mère Poulard’s delicious butter biscuits are available at several local shops. 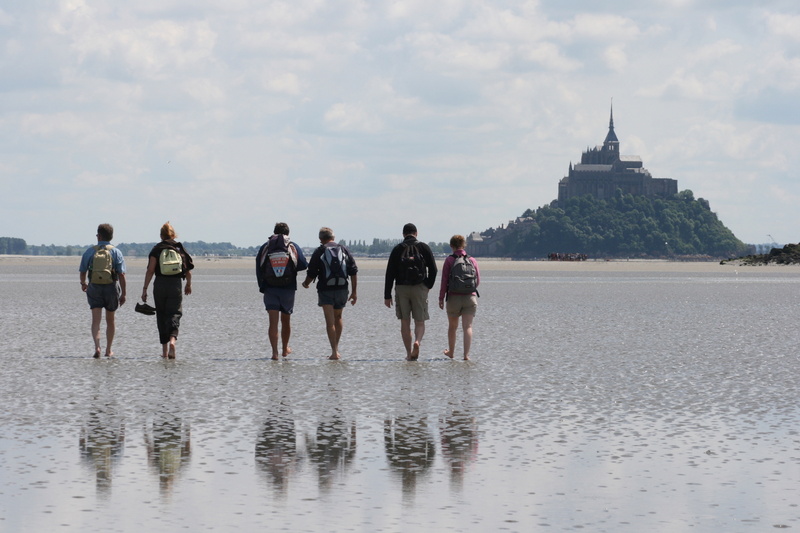 There are seemingly a thousand and one ways to cross Mont Saint-Michel Bay: by foot, by bike, by horse and even by kayak or gyrocopter. The experience introduces you to a particularly varied ecosystem with some interesting flora and fauna. During some crossings led by qualified guides, you can even learn to free yourself from quicksand. Needless to say, crossing the bay alone is dangerous and you should only do so accompanied by a qualified guide. Attention all meat lovers: Lamb from Prés-Salés de la Baie du Mont Saint Michel is one of France’s most prestigious meats. As you might have guessed, these lambs roam the salt meadows and graze on halophilic, saline and iodized plants, which are part of the unique flora of the Mont Saint-Michel bay. The breeding respects ancestral methods and the lambs are raised to the rhythm of the tides. Their meat is distinguished by the finesse of its grain, marbled fat, pinkness and last but not least its exceptional flavor, all of which make it particularly popular in France.